With Independent Contractor Agreements being challenged in recent court cases in California and Massachusetts, AAR CEO Michelle Lind talks about Arizona’s law and how it affects your business. Should I Accept the Referral? What’s the Buzz with Airport Noise? Airport noise can be a nuisance. More importantly, if a property is located within a high noise contour or accident potential zone, it may affect the owner’s ability to utilize the property as intended. This legislative session, a decision was made that will have an effect on speculative or custom homebuilders come January 1, 2015. Today, virtually every special interest group in America has a political action committee fighting for them. Arizona REALTORS® are no different. Get to know the who, what, where, when and why of the REALTORS® of Arizona Political Action Committee. Financial advisors offer advice for Arizona real estate professionals planning for retirement. Don’t get left off the mailing list! Make sure to notify your local association with any address, phone number and email changes. Sign up for RSS updates. 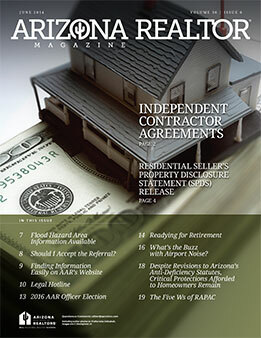 Interested in advertising in the Arizona REALTOR® Magazine?